It’s so easy to get food delivered home now. Deliveroo is on the up and up, UberEats is trying to establish itself, and McD’s has had everyone questioning the fabric of reality with it’s recent announcement of delivery in certain cities (in the UK at least). With a much higher quality of food available in the comfort of your own home, we want a LOT more when we actually do venture out. Cue the rise in “experience bars” – throw axes, darts and bowling balls before, after or during your dinner, and it’s all just part of the fun. It’s not just enjoyable to try something new, but it’s instagrammable as hell AND is best enjoyed with real people, so you can get all the fun of real socialising, coupled with the sweet, sweet social reward of ‘likes’. With all this taking off, restaurants and bars are constantly on the look out for new ways to up their game and branch out from the standard dining experience. If they’re not, they really should be. So what better then to make that an experience you can take with you? Gen Z and Millennials alike know what branding is, and they don’t shy away from it. In fact, they consider themselves brands. With the rise in YouTubers and Instagram Models comes an all new attitude to brand alignment, and the children born from bloggers know how to spin a sponsorship and use that to their advantage, not just for cash income, but social standing too. 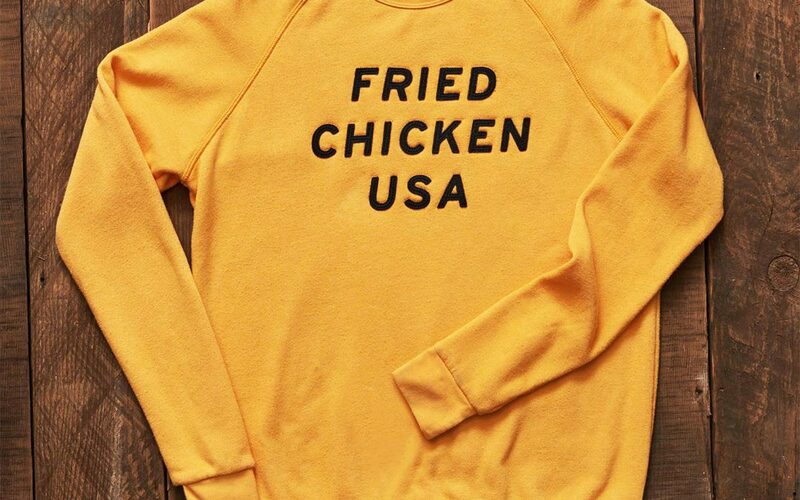 KFC seem to have looked at all the latest apparel trends and thrown everything they have at it. It’s almost a parody, with the golden necklace spelling out “fingerlickingood” to the Colonel Head pins, there’s merch here for the more committed, but little affordable bits too, so it’s infinitely accessible. It all adds up to self-promotion. Turning your customers into walking, talking, socialising bods that will not only talk and wear your brand, but have fun doing it. This is my favourite bit, bridging the gap. Each sector has it’s own way of acting. The way they walk, talk and market themselves. The problem with this is everyone ends up doing the same thing. Seasonal menu changes, father’s day comms, summer sale promo and as a consumer you get hit with slight variations on the same message all at the same time, so nothing stands out. Break out of the routine. Learn from other markets, get into other markets. Even if you’re not actually selling clothes, sell your food as though you are, or go the other way – Johnny Cupcakes set up the t-shirt bakery in London years ago. We could all learn a lesson from this. Shaking up the norm is definitely the way to get ahead and stand-out, even if you carry on doing your day-to-day in the background. Just ask yourself, do your customers actually notice the subtle change in menu every few months, or is that money better spent on a killer campaign that does something they wouldn’t expect? Don’t just run along with the crowd. Re-evaluate what you’re doing and ask yourself if it really matters. KFC haven’t done it by halves. This step into merch has it’s own brand ID, look-book, website, tone-of-voice (a self-aware TOV at that) – the lot. There’s a lot to be said for getting all the basics sorted, and so many brands skip this bit. Great campaign idea, but we’ll just bash out a few hundred flyers and be done with it. Don’t. Get the photos right, make sure it speaks to the people you’re targeting, get all the connections set up and make it the easiest thing in the world to share. Sharing is really important. This stuff might have it’s own look and voice, but it all still links back to KFC’s core social groups, and that’s where the return is. Well done KFC, cue the copycats.